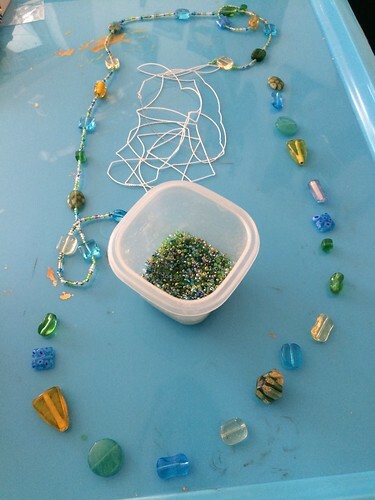 On Saturday, my son LB decided he wanted to make mommy a necklace. We were out of penne and macaroni so I asked him where we should get more supplies at the grocery store or the craft store and he thought the craft store seemed best so off we went to choose beads. I set our sights on the three-floor local craft store, Vibes and Scribes, because I knew they had a nice variety of beads and supplies plus if LB changed his mind there were other things we could source for a crafty afternoon adventure at home. 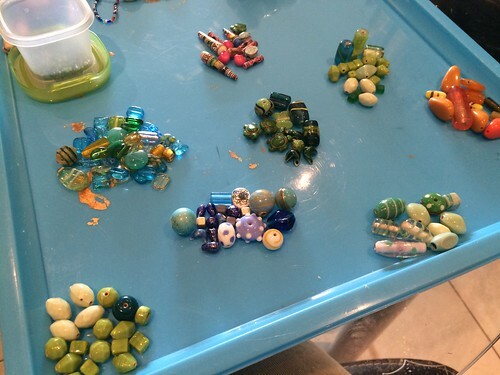 We ended up choosing two kinds of beads: wood beads for stringing practice (great for practicing fine motor skills) and glass beads for a necklace for me to wear. 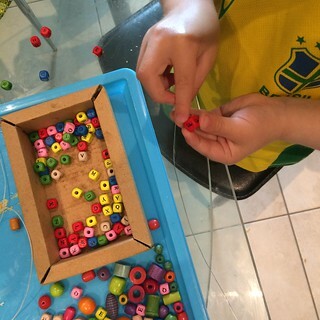 I lifted LB up to the level of the bead boxes and he looked them all over and decided he wanted the necklace to be green and blue and white, though he ended up choosing yellow not write because it was sunny outside and he said it looked like the sun, as three-year-olds do. He didn’t drop or spill the tray of beads, which impressed me to no end! But he chose SO many and in the end I was certain I’d have enough for five necklaces. 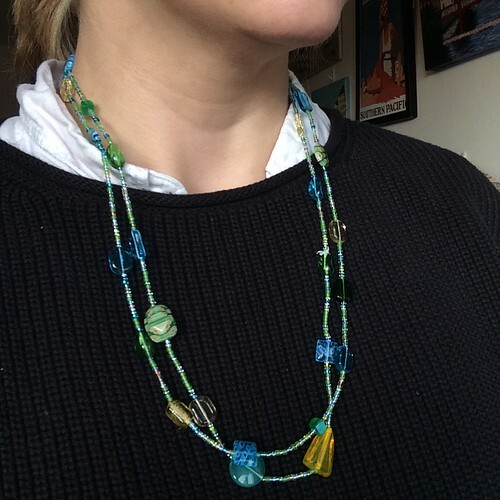 So, this is how I took a collection of beads curated by a toddler and turned it into a beautiful necklace for everyday wear. We set out two trays with raised edges so the beads wouldn’t roll off onto the floor. 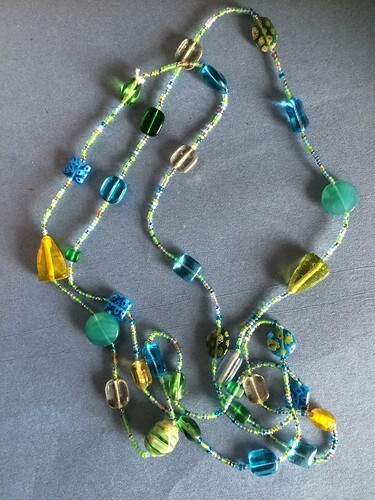 LB was set up with wood beads and blue string and I had glass beads and silk string. Meanwhile, I divided the beads into mini collections of ones with a similar feel to create a few pieces. A few of the beads were ones I had in my bead collection from a decade ago so it was fun to incorporate new and old. 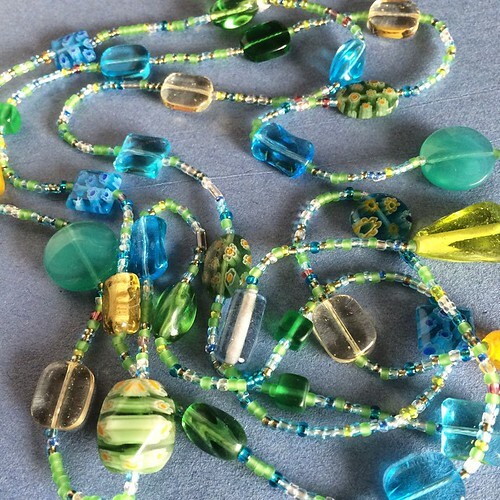 The first necklace would include all the semi-transparent beads that were much like seaglass in their color and light-catching attributes which would make a lovely simple beauty beaded necklace for myself. 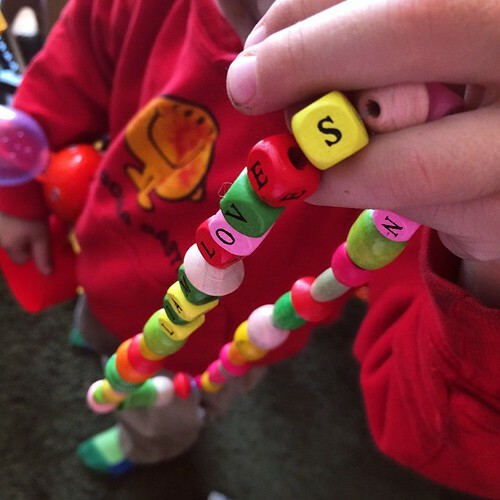 While LB worked away on making a small mess and playing with shapes and colors and even letters, I went to work on my own necklace using the beads he had chosen at the craft store. 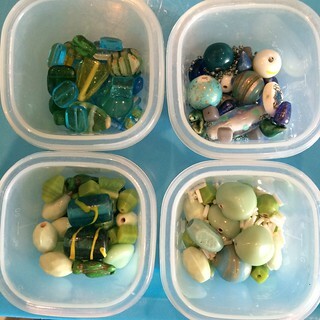 Knowing three-year-olds can change moods rapidly, I kept the beads organised throughout the process to be able to put them away quickly so they’d not go flying in case of toddler turbulence. The small plastic containers I used are actually designed to store homemade baby food, but LB outgrew them a while ago (his stomach capacity makes these only useful for small snacks or spices…or beads). To make my necklace, I chose to have the length be long enough to wrap around twice and not need a clasp to put on. I wanted it to be low enough in drape to not get lost beneath shirt layers. I measured and 47–50 inches seemed like the magic number for this to be achieved. On my tray, I had the container of glass seed beads. 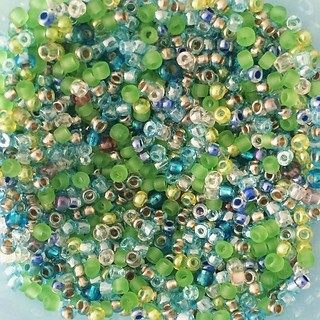 I chose seed beads that were grass green, dark teal, silver, clear, and sky blue. I did not select seed beads with any mindset when stringing them so it has a nice relaxed feel and no pattern. I arranged in an oval the accent beads in the order I wished to use them. This made it easy to just make the necklace. 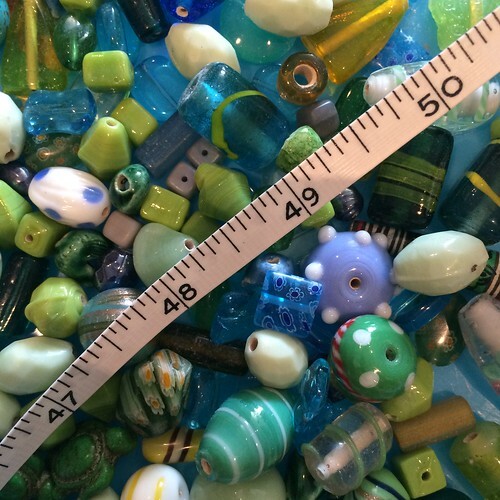 I strung seed beads for 1–2 inches then would add a preselected accent bead. 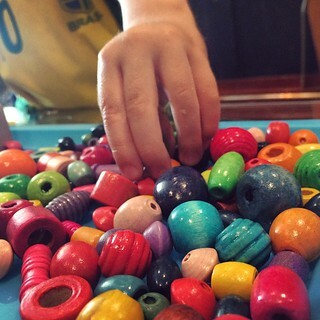 The accent beads were the ones LB chose at the store earlier in the day. And the result was achieved within a couple hours! And LB’s result with a little spelling help and knotting off help from me. But being my mom and always wanting bigger, better, prettier, more generous, she hunted down a strand that was made with seed beads AND handblown glass beads. A beautiful combination that elevates the piece from music festival accessory to office or party wear. I don’t have a photo of the necklace my mom gave me as it originally was since it broke and I restrung it early on, but it is much the same formula as the one I made so the grand unveiling…. When I was very sick in high school, she took me to a bead shop near us and let me go wild buying everything I wanted which ended up being all I did (aside from sleep) when on bed rest for two months. So, to me, beading is a very cathartic activity. 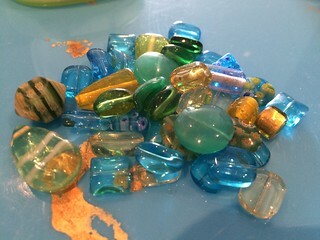 What colors would you use to make your own beaded necklace? This entry was posted in Crafty Mama, Jewellery | Beadwork, Tutorials | Patterns. I love the necklace! The colors are great. I have always wanted to try beading, but the few times I tried, the result was something I would never wear. So I admire from afar. Thanks so much, Kim. It is easier than you think though I’ll admit I’ve been doing it on and off for 24 years so plenty of practice makes perfect time.